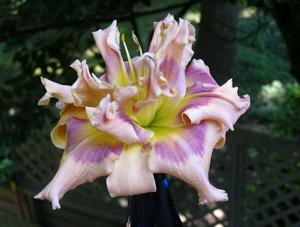 height 32", bloom 5", season M, Semi-Evergreen, Diploid, 10 buds, 2 branches, Double 100%, Pink with lavender eye, green throat. 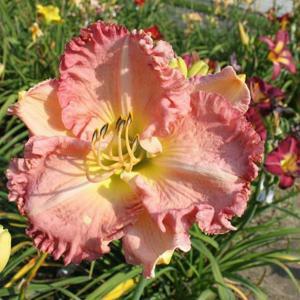 height 34", bloom 5.5", season E, Rebloom, Semi-Evergreen, Tetraploid, 30 buds, 5 branches, Double 90%, Red with prominent veining and cream edge above yellow green throat. 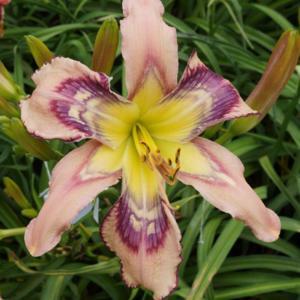 height 27in (69cm), bloom 6in (15.0cm), season E, Rebloom, Evergreen, Tetraploid, 17 buds, 1 branches, Lavender blend with blue and violet patterned eye. 2016 Introduction by Dan Hansen. This is his photo. height 30in (76cm), bloom 6.5in (16.5cm), season EM, Rebloom, Evergreen, Tetraploid, Very Fragrant, 30 buds, 3 branches, Double 99%, Pastel orchid pink blend with yellow halo and white gold edge above green throat. height 25in (64cm), bloom 6in (15.0cm), season MLa, Rebloom, Evergreen, Tetraploid, 23 buds, 3 branches, Double 97%, Burgundy, center petaloids are very full with ruffles, edged in light rose, green to yellow throat. 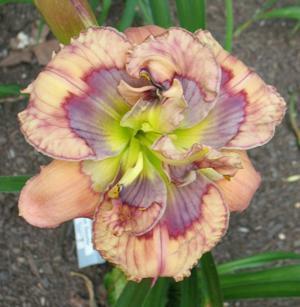 height 34in (86cm), bloom 5.25in (13.5cm), season EM, Rebloom, Semi-Evergreen, Tetraploid, 30 buds, 5 branches, Double 100%, Deep magenta wine with black wine eye and edge above orange throat. 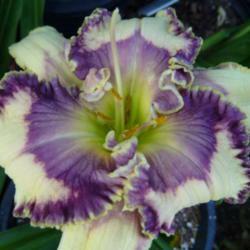 height 32in (81cm), bloom 5in (12.5cm), season M, Rebloom, Dormant, Tetraploid, Fragrant, 18 buds, 4 branches, Double 98%, Cream white with a patterned blue, purple, maroon eyezone, above a very green throat. 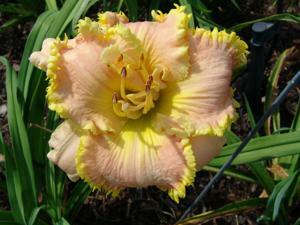 Barbara Watts (Kirchhoff-D., 2008) height 28", bloom 6", season EM, Rebloom, Evergreen, Tetraploid, 20 buds, 3 branches, Double 100%, Peach cantelope cream blend with pastel yellow gold edge above yellow to green throat. 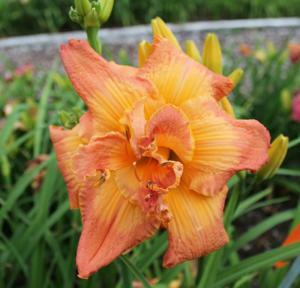 Big Fuss (Joiner-J., 2013) height 31in (79cm), bloom 7in (18.0cm), season M, Rebloom, Evergreen, Tetraploid, Fragrant, 25 buds, 5 branches, Double 95%, Large salmon double, yellow to orange throat. 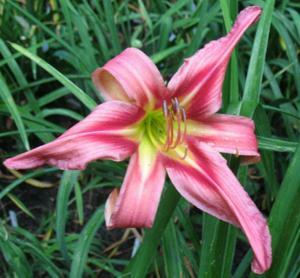 height 31in (79cm), bloom 6.5in (16.5cm), season EM, Semi-Evergreen, Tetraploid, 22 buds, 3 branches, Light pink cream self with cherry red eye and edge finished with a lime green throat. 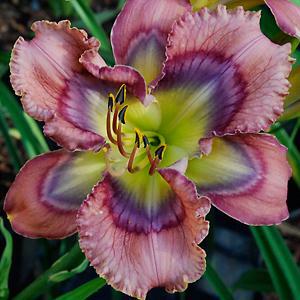 height 28", bloom 5.5", season M, Rebloom, Semi-Evergreen, Tetraploid, Fragrant, 22 buds, 4 branches, Cream pink reverse bicolor with charcoal light blue lavender purple maroon patterned eye above very green throat. Blue Goose (Lambertson, 2012) height 32in (81cm), bloom 6in (15.0cm), season EM, Rebloom, Semi-Evergreen, Tetraploid, 25 buds, 4 branches, Lavender petals and sepals, blue purple eye and edge, cream gold outer edge, green throat. 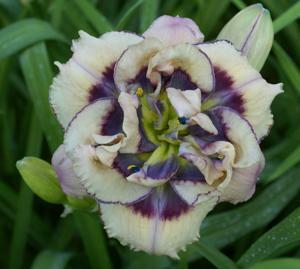 Blue Nocturne (Lambertson, 2013) height 30in (76cm), bloom 6in (15.0cm), season EM, Rebloom, Semi-Evergreen, Tetraploid, 30 buds, 4 branches, Dark purple petals and sepals, chalky blue eye and edge, cream outer edge and green throat. height 43in (109cm), bloom 5.75in (14.5cm), season EM, Rebloom, Evergreen, Tetraploid, Fragrant, 40 buds, 6 branches, Royal purple base, dark blue purple eye, double edge of blue and white with green throat. 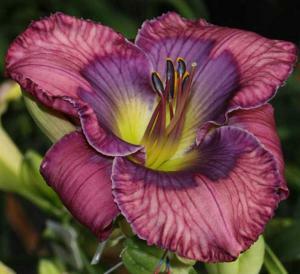 height 33in (84cm), bloom 5in (12.5cm), season M, Rebloom, Evergreen, Diploid, Fragrant, 26 buds, 6 branches, Mauve red with a very green throat, eyezone color on sepals and petals are different shades of blue, various bands of colors are present within the eyezones. 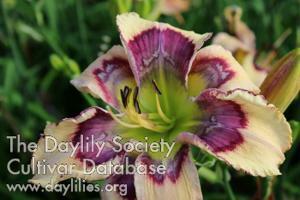 Thanks to Lyle Dye for use of his photo. Bonibrae Miss Direction (Matthie, 2011) height 30in (76cm), bloom 6.5in (16.5cm), season M, Dormant, Tetraploid, 21 buds, 3 branches, Complex eye of up to three arrows with a white-gold edge, large green throat. 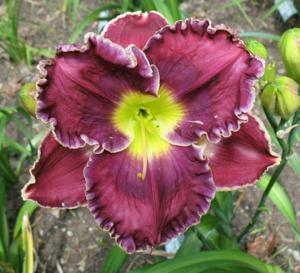 height 20in (51cm), bloom 4.5in (11.5cm), season M, Rebloom, Dormant, Tetraploid, 20 buds, 3 branches, Double 80%, Pink with double edge of dark purple and gold teeth. Bowtie Affair (Pierce-G., 2013) height 42in (107cm), bloom 9in (23.0cm), season EE, Rebloom, Semi-Evergreen, Tetraploid, Fragrant, 40 buds, 5 branches, Cherry, dark wine, and green appliqué. 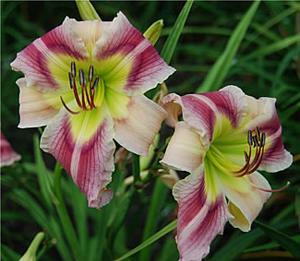 height 28in (71cm), bloom 6in (15.0cm), season EM, Rebloom, Evergreen, Tetraploid, 20 buds, 4 branches, Red with yellow green throat. 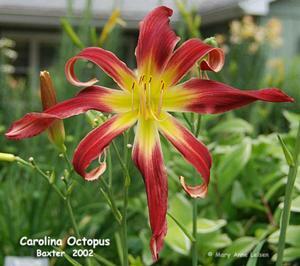 height 32in (81cm), bloom 7in (18.0cm), season EM, Rebloom, Evergreen, Tetraploid, 18 buds, 4 branches, Unusual Form Crispate, Pink with huge red chevron eye above green throat. height 26in (66cm), bloom 5in (12.5cm), season EM, Rebloom, Evergreen, Tetraploid, Fragrant, 35 buds, 4 branches, Cream with patterned eye. height 34in (86cm), bloom 6.5in (16.5cm), season M, Rebloom, Evergreen, Diploid, Fragrant, 27 buds, 4 branches, Double 85%, Rose with a darker rose eye, chartreuse throat, center petaloids protrude and are very ruffled. 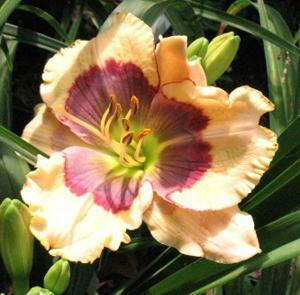 height 26in (66cm), bloom 6in (15.0cm), season M, Rebloom, Evergreen, Tetraploid, 15 buds, 3 branches, Double 90%, Rose with yellow edge and watermark, yellow green throat. Thanks to Dan Hansen for use of his photo. 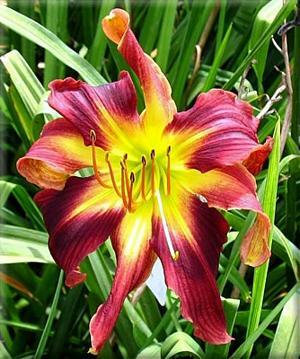 height 34", bloom 7", season M, Dormant, Diploid, 15 buds, 3 branches, Polymerous 55%, Golden yellow with dark red eye above greenish throat. height 24in (61cm), bloom 4.5in (11.5cm), season EM, Rebloom, Dormant, Tetraploid, 15 buds, 3 branches, Double 98%, Rose red with a light rose edge above a yellow throat. 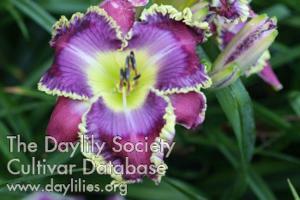 height 35in (89cm), bloom 5in (12.5cm), season M, Rebloom, Evergreen, Tetraploid, 30 buds, 5 branches, Light blue wire edge on a light purple background with a large navy blue eye and a yellow throat. height 34in (86cm), bloom 7.5in (19.0cm), season EM, Rebloom, Evergreen, Tetraploid, Fragrant, 18 buds, 4 branches, Pale pink with pink border above chartreuse throat. Thanks to Carol Robinson for use of her photo. 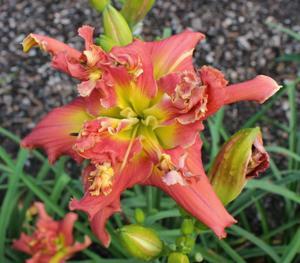 height 29", bloom 6.25", season EE, Rebloom, Semi-Evergreen, Diploid, 30 buds, 4 branches, Unusual Form Cascade, Double 65%. Sunset coral with red band and white flash midrib above yellow to green throat. 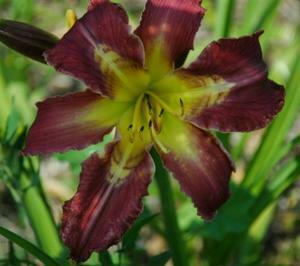 Occasionally blooms single in the early season. Charcoal Eyes (Stamile, 2014) height 32in (81cm), bloom 5.75in (14.5cm), season EM, Rebloom, Evergreen, Tetraploid, 30 buds, 5 branches, Vanilla cream with outer fuchsia band, inner lavender band and wide inner band of gray charcoal in the eye, green throat and partial fuchsia picotee. 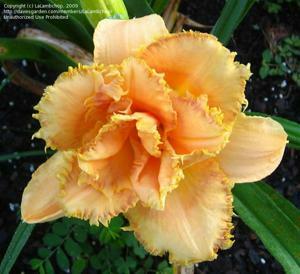 height 29in (74cm), bloom 6in (15.0cm), season EM, Rebloom, Semi-Evergreen, Tetraploid, 15 buds, 3 branches, Flaming red orange with small gold to green throat, and petals edged in light yellow gold. height 38in (96cm), bloom 6in (15.0cm), season EM, Rebloom, Dormant, Diploid, 28 buds, 5 branches, Lavender sepals and lavender petals with purple through the middle, small purplish eye zone with creamy edging and feathered ruffles, green heart extends to chartreuse. 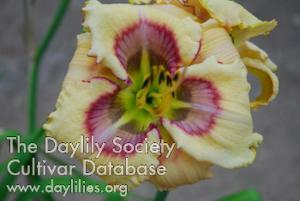 Children Playing (Hansen-D., 2013) height 32in (81cm), bloom 8in (20.5cm), season E, Rebloom, Evergreen, Tetraploid, 20 buds, 5 branches, Bone with variable complex eye, yellow throat. Photo by Dan Hansen. Used with permission. 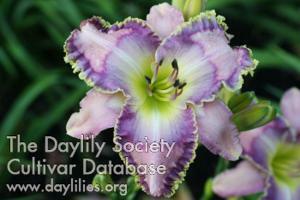 height 26in (66cm), bloom 6in (15.0cm), season M, Dormant, Tetraploid, 14 buds, 3 branches, Double 90%, Purple self. This site has been accessed 279424 times.